>> Para leer esta historia en español, haga clic aqui. DISCLAIMER: This website is NOT affiliated with Inpop Records or Petra. This story was written by Josh Renaud and is the result of his independent reporting. Many fans had been anxiously awaiting a new studio album. Band members have been talking about it with fans at concerts since last fall. As recently as March, drummer Paul Simmons told petrarocksmyworld.com that the band was working on new songs. But the album is not coming. "There will be no new studio album from the band," Hartman said. "There has been some talk about a final live release but I have no confirmation of that." Several factors seem to have led to the decision not to produce the album. Hartman said that Inpop had started talking about delaying a studio album and first releasing a "best-of" album to drum up interest and support. "We figured if it's that hard to get any interest in the band, then we should call it a day," he said. Seboa, the band's manager, explained that the original intent was to release a studio album in fall 2004, a year after the release of "Jekyll & Hyde", an album praised by both fans and critics. "I don't think Bob had it in his heart to pour his heart and soul into another project that quickly," Seboa said. "The band just couldn't come up with enough songs that everybody liked; the right songs." Petra's concert calendar improved in 2004, with a full slate of summer festival appearances and numerous shows abroad, including two in India. In comparison, Petra's concert schedule so far this year has been slim, especially in the U.S. But Seboa says that plans are being developed for two farewell tours in the fall: a two-month stint in the U.S., followed by a couple weeks in Europe. "I want to go to Europe and take another American rock band with us, like Pillar or Kutless, and then finish on a high note," Seboa said. Also in the works is a trip to the Middle East in August, where few other bands go. "There's still work God's doing with Petra, impacting lives," Seboa said. But things began changing in 2003, when the band reversed musical directions. They recorded "Jekyll & Hyde," a straight-up hard rock record. They dropped keyboards from the album and their concerts. Long-time drummer Louie Weaver was dismissed from the band and Hartman announced he would tour again. Petra's concerts in 2004 earned near-universal praise from fans, who were ecstatic about the band's harder sound and newfound energy. "We played more than we had the three years before," said Schlitt. Among the highlights of the year were returning to perform in India, and a special concert in which three of the founding members of Petra reunited to perform for the first time since the 1970s. "We are very thankful for all the great years and especially last year, which gave us many memories we will cherish all our lives," Hartman said. Simmons joined the band as drummer in 2004. He described the time this way: "It has been incredible! I have met so many people, and heard their stories, and shared mine with them. I've seen places all over the world. I've seen God working through our music, and that is the biggest blessing I can imagine. To use the gift God has given me, to share with others. I am so grateful everyday, and pray to remain that way." So why decide to retire now? Hartman said in large part it was that dealing with the Christian music industry in the U.S. had become such an uphill battle. "It has become increasingly harder to get concert bookings in the U.S.," Hartman said. "We don't play enough to support everyone. We have to seek other income as it is. "We have been having great concerts outside the U.S. and those have been the highlights of the last couple of years. But you can only play those so often. Bottom line, we feel it's time to retire gracefully before we completely wear out our welcome." Schlitt said the band was waiting to see if they would receive interest from all the festivals they had played the previous year. "When they all fell through and there wasn't any interest anywhere except in California, we said 'There's nothing else we can do,'" he said. Seboa, the band's manager, explained that Petra had trouble reaching their target demographic in an increasingly radio-driven industry. "The problem with Christian radio is that it's funded by your 'soccer moms,' 25 to 35-year-old women," Seboa said. "They are the ones who contribute most of the donations to radio stations. And they tend to not want to support a lot of rock acts." Additionally, Petra failed to adapt to the mass market the way that others like Newsboys' front man Peter Furler did, Seboa said. During the period when Petra wasn't putting out good modern music, many industry people moved on. The band earned back some respect with their "Revival" and "Jekyll & Hyde" albums, but it was too late. Brent Handy, an industry veteran, recently worked with John Schlitt on "Project Damage Control." "The band thought that 'Jekyll & Hyde' was a make-or-break album," Handy said. "I think everyone is bummed that it hasn't been received by the industry or the mass market with open arms." Justin Murr, of the band Liberty n' Justice, knows firsthand about the struggles of trying to sell older-style rock albums in the modern market. He worked with Schlitt on a project called "Welcome to the Revolution." "Christian radio and Christian media turned their backs on Petra," Murr said. "Instead of applauding them for their years of ministry, for reaching the lost, and for encouraging the believers, they told Petra they didn't matter." Age was also a factor. Hartman and Schlitt have gotten older, Seboa said. "If I've got a radio station and I'm starting a concert series, am I going to invest my time in a band that I know is going to end sooner rather than later?" he asked. "Or will I invest in a new, up-and-coming band that I can have a business relationship with for the next 10-15 years?" Handy said that while working with Schlitt, Schlitt expressed frustration with having to compete with the younger, leaner frontmen. "John joked about getting old. I told him that he sounded better than ever to me," Handy said. "I think it is safe to say that John saw the writing on the wall." Five years ago Seboa told Schlitt that the band needed to start looking for the right exit. "I told him I wanted to end it on a good record. And 'Jekyll & Hyde' is a good record," he said. "It's the right way to end it. Everyone gets along good. No arguments on the road. We'll all enjoy each other's company. "It's just been a good last two years." Our coverage of this story will continue throughout the coming weeks, so please keep checking back. 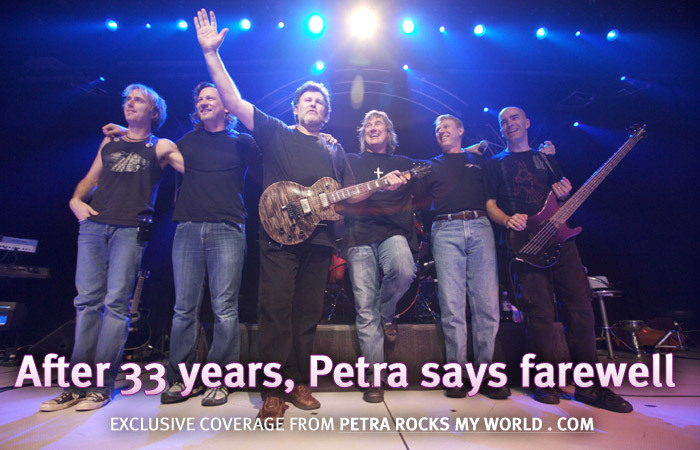 Also, the band has finally published an official press release on its website, petraband.com. I am compiling a collection of stories and testimonies about the way Petra's ministry has impacted people around the world. If you would like to share your story, please send it to me. You can talk about this story with other Petra fans on our messageboard.